It's snowing in the UK therefore it will start snowing on my blog too! Stay tuned over this week for plenty of snowcapped photographs. I was laughing when I took the photo so don’t worry! sadly an hour walk in the snow still wasn’t enough to make him sleep! I hope you warmed his little paws by the fireplace after this! 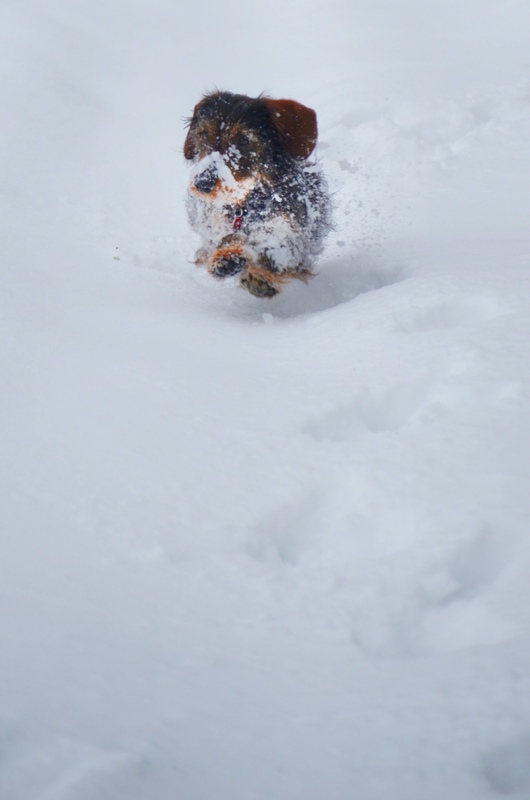 Looks like he was trying to fly over the snow. This is nice to see the happy side of snow as snow kills on roads etc. and I’m snowed in where I am yet again(lots of us) but we not hungry which is something. Little innocent animal looking so cute. 1st Prize. The best thing is throwing snowballs into the snow, they just can’t comprehend where it went!